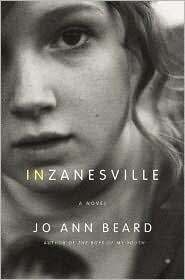 Jo Ann Beard’s debut novel In Zanesville landed in my lap during just the right fit of nostalgia. The previous night I’d watched the teen-aged girl next door waiting to get picked up by a carload of friends. She and her mom and her mom’s boyfriend had all busted out of the house with this contagious and giddy Friday fever. The girl needed a couple flashlights. Her mom gave her one, she clicked it on and off, made swirls of light. Her mom’s boyfriend went to his truck to get another. “I’m going to throw it away when I’m done with it,” the girl joked. Everyone was in a really good mood. Practically dancing out of their skin. It had started to drizzle and her mom commented on the rain. “I’m wearing water-proof lip gloss,” the girl said. Then off she went. What was I doing 20 years ago on this night, I wondered. Cramming my friends into my Chevy Celebrity with its magic radio that could pick up Minneapolis stations, my wrists instinctively twisting left and right to land on every possible awesome frequency. Lips blue from a Mister Misty Freeze. Stopping by the community college to watch summer league boys basketball, waiting afterward in the parking lot for the right shaped boy-shadow to lope from the gym doors. Buying $15 worth of toilet paper to chuck into trees and wrap around cars. Beard’s unnamed protagonist, presumably named Jo, could be any of us in the 1970s. She’s a 14-year-old, inseparable from her best friend, Felicia. When the story opens they are co-babysitting a handful of rowdy tots whose parents belong to a motorcycle gang. One of the kids has set the bathroom wastebasket on fire and the duo is collecting kids and pet reptiles and vermin and considering what this job loss will mean for the clothes they have on layaway at a local store. The protagonist’s mom shows up, so does the fire department. Later, the police. The girls are “late bloomers,” according to Felicia’s mom and “weird” according to themselves. They’re tight. Neither popular nor not. Hyper-aware enough to know that if they don’t ditch out on marching band in the seconds before the big parade, they will be associated with these uniforms for the rest of their lives. And so there they sit on the grassy knoll overlooking the parade and earning detention. The story covers a few pivotal months during which they dabble in dudes and crushes, develop new interests and negotiate the downside of popularity. The narrator, animal sensitive, bookish, funny, and self-described as looking like an abstract painting, has a casually employed father who spends most of his time getting hammered, observing birds and repeating “I’ll say this about that.” Things get a little tense between her and Felicia when they are randomly invited to a cheerleader’s slumber party, boys show up, Felicia gets paired up and the narrator plays 11th wheel. Beard’s story isn’t my story, per se, but the essence is there in a way that reminded me of Tom Perrotta’s “Bad Haircut.” There were parts of this story — a pleasure read that probably won’t make my Top Ten but kept me entertained enough to bust through it in a single sitting — where I knew exactly what Beard was talking about. The self-consciousness of walking into a stadium with plans to meet a boy in Section C, feeling that all eyes are on you and your frumpy shuffle. Ha! My first car was a Chevy Celebrity. Blue. Four door. Tape player. Used to belong to a nun before me. Oh yeah.